Susan Mallery returns to Mischief Bay, California, with the stories of three friends whom readers of The Girls of Mischief Bay will recognize: Gabby Schaefer, Hayley Batchelor and Nicole Lord. Gabby’s twin daughters are ready for kindergarten, and Gabby is counting the days until they are in class and she can resume her law career. A chance to use her knowledge, albeit only twenty hours a week, ranks just slightly above bathroom privacy for reasons to rejoice over returning to work. But just when Gabby’s life promises to become even better, her fifteen-year-old stepdaughter shares news that throws the family into chaos. Andrew, Gabby’s perfect husband, reveals his flaws, and their different reactions to the family crisis threaten the stability of their marriage. Can Gabby and Andrew find their way back to each other? Gabby is not the only one whose marriage is in trouble. Hayley, who has suffered a series of miscarriages, is still obsessed with bearing a child. Ignoring her doctor’s advice and her husband’s concerns, she is determined to pursue a prohibitively expensive treatment regardless of the cost to her health, physical and emotional, and to the couple’s financial well-being. Rob refuses to cooperate with what he is convinced is self-destructive behavior. When Hayley persists with her plan, he leaves. Hayley is devastated by what she sees as his desertion, but is she willing to give up on what she wants most to save her marriage? Nicole is finding life after divorce an improvement over her unhappy marriage, but dating again is not easy. Her fitness business is flourishing, and her six-year-old son Tyler is healthy, happy, and devoted to Brad the Dragon. When the creator of Brad the Dragon, Jarius Sterenberg, becomes not just a name associated with the popular children’s series but also her son’s personal hero and a major presence in Nicole’s life, she is afraid to make a commitment. If her son’s own father has no qualms about withdrawing completely from his son’s life, how can she trust another man not to abandon Tyler and not to break her heart? Gabby, Hayley, and Nicole support each other through these crises, offering a ready ear, honest words, and plenty of hugs. Mallery is at her best in this nuanced portrayal of female friendship. The women are likeable, and their problems are rooted in the real rather that in manipulative melodrama. Their lives are multifaceted, and Gabby’s relationship with her stepdaughter and Hayley’s relationship with her sister add interest to their stories. The men in their lives are different from one another in profession and personality. I considered that a real plus after having read some multiple story novels in which the male leads all seemed to be generic heroes. I count myself a Fool’s Gold fan, but Mallery’s women’s fiction titles rank even higher with me. 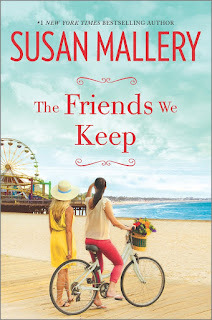 The romantic element is strong enough for The Friends We Keep to appeal to Mallery’s romance fans, but it is the friendship that links these women in credible and heartwarming ways that is the heart of the book. If you are a reader who appreciates women’s fiction/romance hybrids, I suggest you add this one to your list. Already on my list. Love her work. I picked this one up on sale. Now I have to get the first one to read before that. I love this book of friendship. The three women in this book have been through a lot together and continue to be there for one another. The different things going on in their lives cause you to happy, sad and mad for them. You cheer for them & cry for them. I didn't want the story to end. I hope she continues this story line. 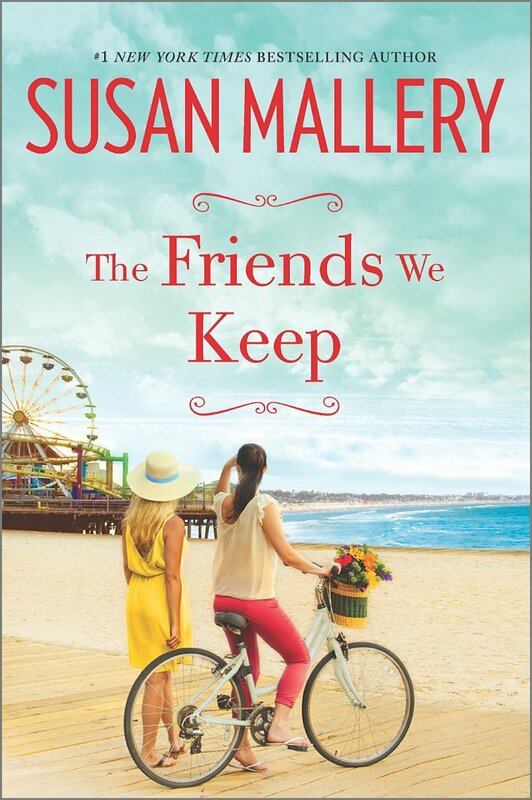 I love all of Susan Mallery's books.